Bring up the topic of alcohol and breastfeeding and more than likely you'll hear a mixed bag of opinions on how safe it is, how it affects breast milk supply, and how you should resume breastfeeding after drinking. With all the conflicting views, it can be hard to sort out the facts from the myths. Sadly, some of those myths can erode a woman's desire to breastfeed or damage the breastfeeding relationship with her baby. That's why it so important to make sure you have the correct facts about alcohol and breastfeeding. The key phrase in this is any alcohol. While frequent, excessive drinking is strongly discouraged, there is nothing wrong with the occasional alcoholic beverage. Nursing mothers should only drink in moderation. A good way to put a number on "drinking in moderation" is limiting drinking to a single beverage one or two times a week. Go ahead and enjoy a glass of wine or favorite beverage every now and then. The time required for alcohol to leave your breast milk depends on your body weight, the alcohol content of the beverage you were drinking, how many ounces you drank, and the amount of time it took you to drink it. That being said, if you can safely (and legally) drive a car without concern of a DUI, you are most likely sober enough to breastfeed your baby. Waiting at least two hours after a single drink is the wisest course of action. The myth that alcohol builds milk supply is a pretty old one, based largely on lay opinions. Research has not only debunked this myth but showed the exact opposite to be true. Not only does downing that beer or glass of wine not build supply, it actually serves to decrease your breast milk supply and inhibit milk letdown. It is far better to stick with established methods of boosting breast milk supply instead. This myth ties back into the myth about blood alcohol levels. Your breast milk will have the same alcohol level as your blood. "Pumping and dumping" will not speed up how your body processes alcohol out of the system. All your body needs is time to rid your breast milk of alcohol. There is no need to pump and dump milk unless you are experiencing discomfort from engorgement. The American Congress of Obstetricians and Gynecologists recommends waiting for two to four hours after a single drink before breastfeeding, at which time your baby's exposure to alcohol will be very low. This myth is also far from the case. When you drink, the alcohol content is diluted in your bloodstream, and the alcohol in your breast milk is diluted in your baby's bloodstream. Think of it this way, the average glass of wine is around 10 percent to 12 percent alcohol. A mother who is 120 pounds who drank two to three glasses of wine over an hour would have an estimated blood alcohol content of between 0.06 percent to 0.10 percent alcohol. That's significantly less. The same goes for your baby. If he would drink breast milk that was 0.08 percent alcohol, his alcohol level would be far less than that. However, as a baby has much less blood, the dilution will be less. This is why it is recommended to wait to breastfeed until most of the alcohol has left your bloodstream. The myth that as alcohol transfers to breast milk it will have a soothing effect on the baby is fairly persistent. However, medical research has shown the opposite to be true. Breastfed babies of light drinkers sleep less than babies of non-drinkers. Alcohol in breast milk actually disrupts a baby's active sleep (the nice deep sleep that we all need). Therefore alcohol causes a baby to wake more frequently a night. So if you are looking for ways to get your baby to sleep better at night, this is not a method you want to use. 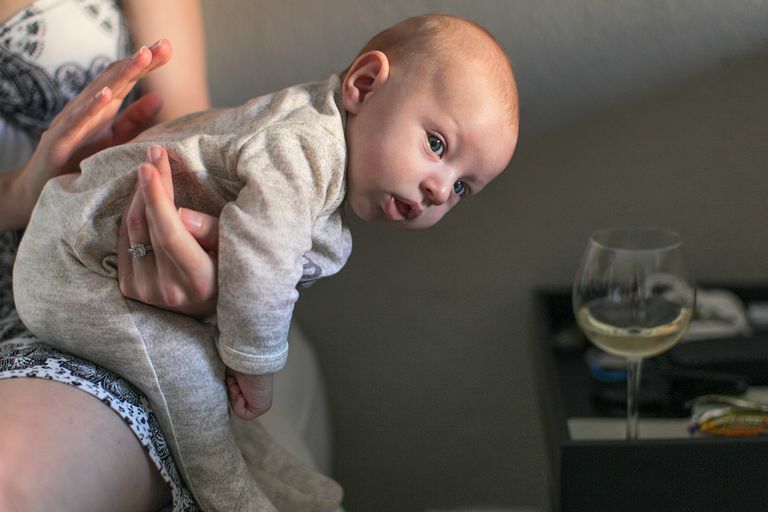 Stepping away from our short simple answer to give a more complicated response, what research shows is that those babies of mothers who drank alcohol experienced disruptions in the amount of time they spent in active sleep. Incidentally, it's not just babies who have experienced this disruption, tests run on adults and animals who drank alcohol also experienced issues in the same area. What's even more troubling, if a mother would try to use this technique on a regular basis, drinking even one alcoholic beverage on a daily basis can have negative effects on a baby's gross motor development. It is simply not a road that parents should go down. Responsible drinking in moderation is fine, but don't go overboard. You should never cosleep if you have been drinking. Your breast milk will be safe for your baby to drink if you allow time for the alcohol to leave your system naturally. Breastfeeding mothers do not have to avoid alcohol entirely. It is possible to find a balance ​between drinking safely and responsibly without having ill effects on your baby's health or your milk supply. Committee Opinion No. 496: At-Risk Drinking and Alcohol Dependence: Obstetric and Gynecologic Implications. Obstetrics & Gynecology. 2011;118(2, Part 1):383-388. doi:10.1097/aog.0b013e31822c9906. Giglia RC, Binns CW. Alcohol, pregnancy and breastfeeding; a comparison of the 1995 and 2001 National Health Survey data. Breastfeed Rev. 2008 Mar;16(1):17-24. Mennella JA, Pepino MY. Biphasic effects of moderate drinking on prolactin during lactation. Alcohol Clin Exp Res. 2008 Nov;32(11):1899-908. Epub 2008 Aug 18. Pepino MY, Mennella JA. Effects of breast pumping on the pharmacokinetics and pharmacodynamics of ethanol during lactation. Clin Pharmacol Ther. 2008 Dec;84(6):710-4. Epub 2008 Jul 2. Pumping and Dumping: Myth or Must-Do? Drinking While Breastfeeding: What's Okay, What's Not? Breastfeeding: What Does Pump and Dump Mean?